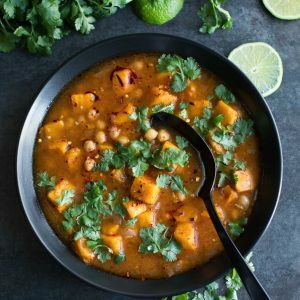 Spicy Moroccan Sweet Potato Soup with both Instant Pot and Stove-Top instructions. This hearty vegan sweet potato soup is loaded with tasty chickpeas and veggies in a flavorful harissa spiked broth! I’ve had this soup recipe in my recipe scrapbook for 2 years and finally (FINALLY!) got around to trying it. As you may have guessed, I’m currently kicking myself for waiting long. It’s positively delicious! I tinkered around with the spice level a bit and used easy-access sweet potato in place of the pumpkin the original recipe called for… I even tested it for both the stove-top and Instant Pot, WOOT! Now this is the part where I beg you not to be like me, and save this bookmarked for 2 years without trying it. Y’all are smarter than that. I always keep a few packages of garlic naan in my freezer to make flatbread pizzas and dunk into curry. These bad boys came in handy the following day, when the sweet potato fell apart during reheating and the soup turned into this lusciously thick soup + curry hybrid. I warmed up a little naan, tore it into pieces, and dunked it into the soup as I ate. Holy cow it was good! I think I’ll be serving this soup with naan from here on out! 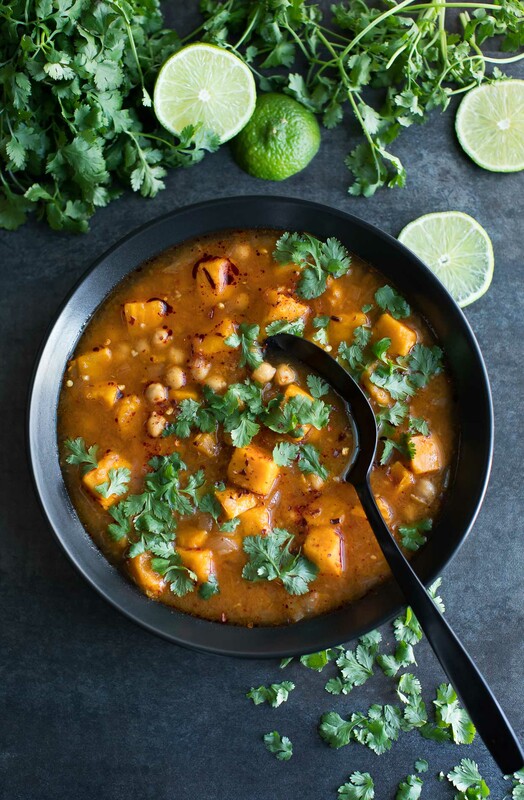 You can make this sassy Moroccan sweet potato soup as spicy or as mild as you’d like. I’m partial to serving it spicy (SO GOOD) to warm up a cold day! As written this one-pot soup recipe is vegetarian, vegan, dairy-free, grain-free, gluten-free, and gloriously plant-based. It checks a whoooole lot of boxes, lol! 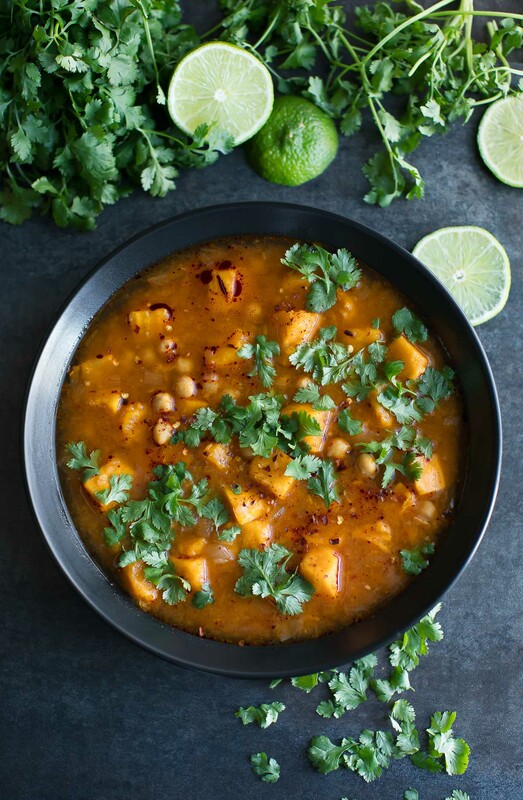 Spicy Moroccan Sweet Potato Soup can be made in the Instant Pot or Stove-Top! This hearty vegan sweet potato soup features chickpeas and veggies in a flavorful harissa spiked broth. Peel and cut sweet potatoes into 1-inch pieces. Dice onion and mince garlic. Drain and rinse chickpeas and set all your veggies aside separately. Switch Instant Pot to SAUTE function and add a little cooking oil to the inner pot. Once hot, sauté onions until slightly tender, adding garlic at the very end and mixing well. Turn OFF Instant Pot and add vegetable broth. Mix well or scrape to deglaze the pot and make sure no browned bits of onion are left stuck to the bottom. Add sweet potato cubes, chickpeas, harissa paste, cumin, salt, and pepper. Lock lid with valve in the sealing position. Set to 3 minutes HIGH pressure. Soup may take 15-18 minutes to come to pressure before starting 3 min cook time. When the IP beeps, allow to naturally depressurize for 5 minutes then quick release the remaining pressure by flipping valve to venting position. Allow a spoonful or so to cool and give it a taste! Adjust spice level to taste (I added extra harissa and red pepper flakes) and add any additional seasoning desired. Spoon into bowls and garnish with fresh cilantro and lime wedges that can be squeezed into the soup for a burst of citrus flavor! A little cinnamon, greek yogurt, or coconut milk also make tasty additions to this soup. We love ours with a side of toasted naan for dunking. Enjoy! My soup took about 15 minutes to come to pressure and I allowed it 5 minutes to naturally depressurize before flipping the vent to release the remaining pressure. if additional ingredients are added it may take longer to pressurize. A larger IP (8 QT versus my 6 QT) may pressurize more quickly. If desired, chicken broth can be used in place of vegetable broth. No harissa? Try it with tomato paste instead and add a little heat using hot sauce and/or crushed red pepper flakes. SEE POST BELOW FOR STOVE-TOP INSTRUCTIONS. Recipe adapted from Real Simple Magazine October 2016. This spicy moroccan sweet potato soup can also be made in a pot or dutch oven on the stove. For extra flavor let’s take things up a notch and roast our sweet potato first! If desired you can skip this step and simply let your soup simmer longer to cook the potatoes. Easy peasy! Toss the sweet potato with 2 TBSP oil and season with *half* the salt and pepper. For extra flavor, you can also roast your chickpeas — we love the added texture and flavor! Roast until tender for 20-25 minutes until tender, flipping the sweet potato cubes halfway through with a spatula for even browning. While your sweet potato roasts, heat an additional tablespoon of oil in a large pot or dutch oven over medium-high heat. Sauté onion until tender with golden edges. Add garlic, cumin, and remaining salt and pepper. Cook for an additional 2 minutes. Add harissa, broth, and chickpeas. Bring to a boil then reduce heat to medium to simmer. Simmer for 5 minutes then remove from heat and stir in your roasted sweet potato. Spoon into bowls and garnish with fresh cilantro and lime wedges that can be squeezed into the soup for a burst of citrus flavor! Red pepper flakes, greek yogurt or coconut milk and/or a pinch of cinnamon also make tasty additions to this soup. Enjoy! 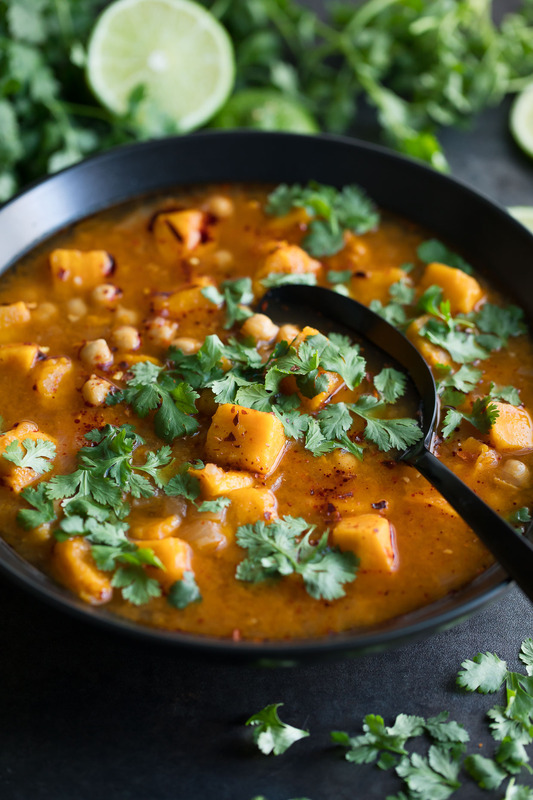 If you get a chance to try this Spicy Moroccan Sweet Potato Soup, let me know! Leave some love in the comment form below or tag your photos with @peasandcrayons on Instagram so I can happy dance over your creation! I can’t wait to see what you whip up! Honey Harissa Vinaigrette <– one of my favorite salad dressing recipes EVAH! This recipe fit just at the max fill line in my 3qt instapot. So good! thank you for the sweet potato for pumpkin swap since I love sweet potato and as a Moroccan flavored new and very interesting flavors, at least to me! It’s such a fun flavor profile – we’ve been all about the Moroccan recipes lately here! I know you said you made this in a 6 qt, but I wonder if the volume of ingredients would allow it to also be made in the 3 qt (this looks like a great recipe to make during our travels in our small campervan). Thanks! We are currently traveling (with just the 3 qt), and will wait til we get home (and access to the 6 qt) to try it. If it’s too much for the smaller IP, simple to then just switch to the larger one. Can’t wait to try it! 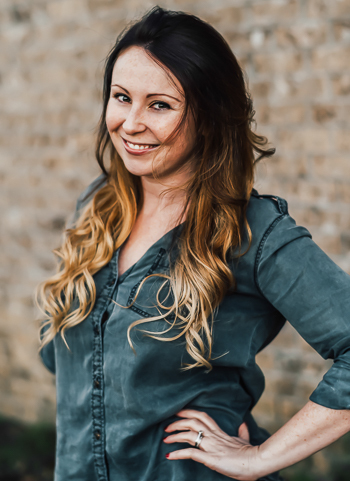 Perfect game plan – I’m so excited for you to try it Barbara! Thanks! I love Moroccan flavors and this soup looks so delicious! I can’t wait to try it! What a beautiful recipe for the winter. I love the spicy heartiness of this soup and also love that it can be made on the stovetop as well as the instant pot.